We offer limited rental services and planning to introduce full services soon. We choose our suppliers carefully from all over the worldwide. We provide regular and preventive service / maintenance to our own equipment. We Service, Maintain & Repair Heavy Equipment's. We provide regular and preventive service / maintenance to our own equipment that we use ourselves and to the used equipment that we sell commercially and which is also our core business . We offer repairing services to all kind of Heavy Equipments for earthmoving, power generation, road building, concreting and asphalting etc . From almost 40 years we've been helping people buy and sell used heavy equipment. We provide services that make it easy – and the information you need to buy and sell heavy equipment with confidence. Our mother company MASIC establsihed in 1933. Why Choose SAS as Your Partner? Saudi Advanced Services Co. (SAS) is a limited partnership between Al Subeaei family (www. Masic.com.sa) and Mr. Manie Al Khelewy. 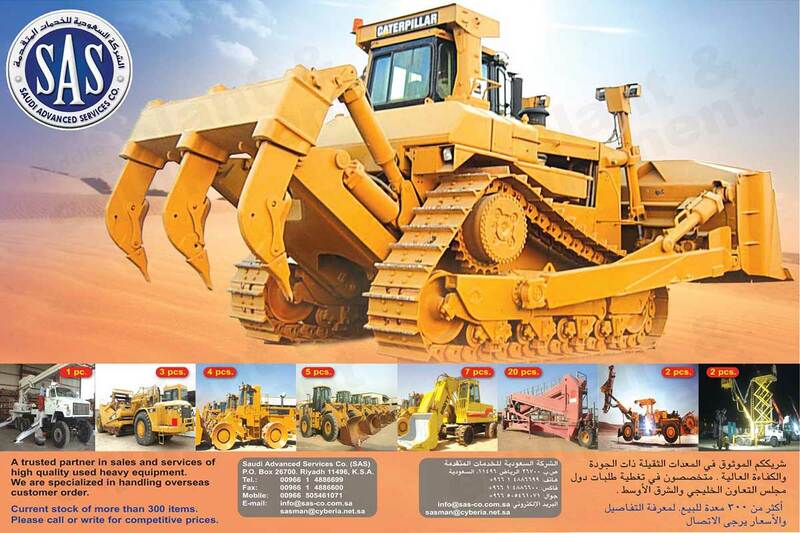 SAS deals in heavy construction and earth moving equipment, military equipment supplies, power generation system. SAS is well known for quality products and services having extensive experiences with major brands such as Caterpillar, Komatsu, Liebherr, Volvo, Scania, Kenworth, Astra, Atlas, Voest Alpine etc. We also provide technical solution for logistics and equipment supply. SAS has experience in dealings with cross border customers from GCC countries. We choose our suppliers carefully from all over the worldwide , who are well known for their quality products and services. © 2012 Saudi Advanced Services Co. All Rights Reserved.